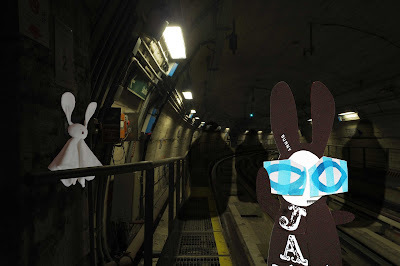 The Wabbit swiped his new app and his eyes flashed brightly and stayed bright. 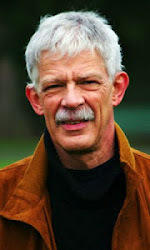 "I am your destiny," he growled, "Follow me." Then the Wabbit moved past the shadows without acknowledgement and hopped into the tunnel. "State your crimes, by the way," called the Wabbit. His voice echoed from the walls. The shadows wailed. "Our only crime is that we separated from our objects." The Wabbit did not reply and he hopped along the rails without a backward glance. "Wabbit," whispered Ghost Bunny. "Their objects don't want them back." 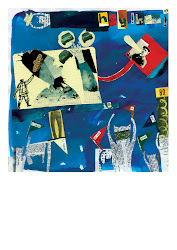 The Wabbit nodded - but he kept going and the shadows followed. "Supposing I found you new objects." The Wabbit's tone was clipped and even Ghost Bunny felt nervous. The shadows wailed eerily along the tracks. "Great One, truly you are the Wabbit of whom they speak." Points snicked in the distance. Ghost Bunny fluttered close to the Wabbit and communicated telepathically. "What's the plan, Great One?" The Wabbit silently replied. "They want objects, we give them objects." Ghost Bunny floated and thought. She had no idea what these objects might be and probably neither did the Wabbit. But she could see he was thinking. Now the Wabbit's voice was sharp. "I would find you a new object world requiring shadows. Alas, I'm on my holidays." The shadows howled in disappointment as the Wabbit wheeled round to face them. He hissed and paused. "Luckily you have my interest ..."